The Steelers are giving a lot of money to the NFL this season, as Wednesday two more of their players were hit with fines over the league’s uniform policy. Running back DeAngelo Williams and cornerback William Gay were both hit with fines, both looking to support causes that are near and dear to their hearts. Williams was hit with a first-offense fine for $5,787 for wearing “Find the Cure” in his eye black in honor of breast cancer awareness. The running back told ESPN that he has worn the eye black for years, but that didn’t seem to matter. As for Gay, he was fined the same amount for wearing purple cleats to show support for domestic violence awareness. The CB’s mom was shot and killed by his stepfather when hey was 7. Gay has gone out of hiw way to support the cause against domestic violence for years. Another Steeler, Cam Heyward, was hit with a fine for wearing “IRON” and “HEAD” under his eyes in support of his father, Craig “Ironhead” Heyward, who battled cancer before his 2006 death. Heyward has appealed his fines, and the league significantly reduced his total of $17,363 for two offenses, with the agreement that he show support for his father in other ways. 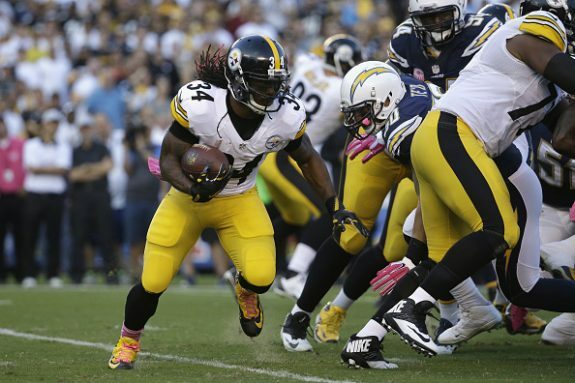 Be the first to comment on "DeAngelo Williams and William Gay Both Fined for Uniform Violation by the NFL"